Zine Goal: To get my perzine “Crone” finished and make a separate 24 hour zine. Zine Goal: I plan to write about my trip to Niagara Falls – my fear of water, long car rides, and the wheelchair accessibility of the park. My goal is to get it done, and be pleased with how it turns out. Zine Goal: I’ve created lots of artist books but only one true zine. My goal is to make a zine that I can be proud of and rid myself of zinemaking trepidation. Zine Goal: I am thinking about making a mini zine about my pregnancies. Or my relationship. I have a lot of ideas, I just need the right motivation to get started!! I haven’t made a zine since the 2007 24 hour zine thing so I’m ready to go!! Zine Goal: GET OVER MY OWN DAMN SELF AND MAKE A DAMN ZINE. Zine Goal: I want to make a mini-zine about bento box lunches! Zine Goal: I would like to make a zine about farming, in particular the farm I am staying on this summer! Zine Goal: To remember to get it done! Zine Goal: Just to finish a zine period. I haven’t done one in years, & I want to get back on track. 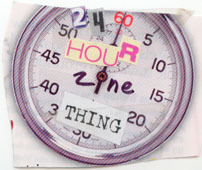 Zine Goal: To complete a 24-page zine. I have so many half-made zines lying around that I really do need to just finish one for once. Zine Goal: To finally complete this challenge! I always sort of bend the rules each year, or never send my zine in. Zine Goal: 24 pages and GRAPHICS instead of the plain white background I usually do. More images cut from magazines and pasted in. Lots of visual stimulation. Zine Goal: To make a zine that is partially typed, but also features my handwriting, and to use materials I’m not used to zining with. Also to make something without a lot of white space or lame filler pieces. will lovingly force me to make issue 4.
great graphics and unusual materials I’ve collected. Zine Goal: Size: 3 5/8″ x 6 1/2″ or the size of a standard envelope. authentic. The only lie? My name. Zine Goal: I want my handwriting to be legible. overthinking it and taking months to finish it. been thinking about it for awhile and this is the motivation i need. Zine Goal: To finally finish a damn zine this year! Zine Goal: My first completed zine! Zine Goal: I have no idea. Zine Goal: To complete my first zine! 2007 and I finally want to DO it. zine done in 5 hours!